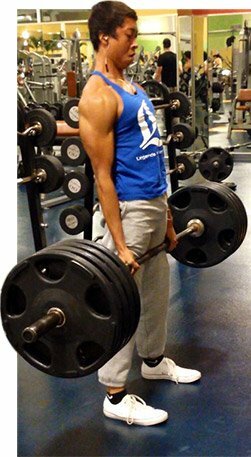 Body Transformation: Dezmon Metze Stacked Slabs Of Muscle Onto His Frame! Dezmon followed his older brother into the weightroom and never left. See how this teen beast reshaped his physique and uncovered ripped muscle! I played football and wrestled growing up but wasn't into lifting or eating healthy until I saw my older brother come back from college. I looked up to him and saw him lifting constantly. He asked me to work out with him, so I did and got hooked. Lifting became my stress reliever. The first day I stepped into the weightroom, I knew it wouldn't be a hobby. Training became my lifestyle. I look forward to working out every day. Bodybuilding.com pushed me to the next level and taught me everything I needed to achieve my goals. As the years passed, I got my nutrition and workout routine locked down and noticed good changes. The people around me noticed too, which made me feel amazing and drove me to work twice as hard. I believe in the three Ds: discipline, dedication, and drive. These are the key factors for anything in life. I stayed dedicated to my diet and workout regimen, which pushed me to the next level. Every day was an opportunity to get better in the gym. I'm not competing against anyone in the gym. I strive to be better than the day before. Learning about nutrition was a major key because I was able to control what went into my body. My calories range from 2,000-4,500 depending on my goals. Eating high carbs and protein with low fat delivered my best results. "The only limitations in life are set by yourself. You can accomplish anything if you stay dedicated." It was hard for me to work, go to school, and attend wrestling practice simultaneously. My only choice was to wake up at 5 a.m. to eat breakfast, hit the gym, and get ready for school. The point is that if you really love it, you will do it no matter what. There are also more entertaining choices than working out on a Friday night. It's tempting to hang out with friends and go out, but you must set priorities. I want to become known to the fitness industry and be a fitness model. I want to compete in men's physique also. For now, I'd love to be a fitness trainer to help others reach goals and live healthy. Helping people reach their fitness goals is the best job in the world. The only limitations in life are set by yourself. You can accomplish anything if you stay dedicated. Keep searching for the right workout routine and diet until it works. It will be a long process, but you will make it and the results are unbelievable. I wouldn't know much about fitness without Bodybuilding.com. The community helped me gain knowledge about nutrition, workout plans, and commitment. Bodybuilding.com played a huge role in my success. I can't express that enough. The forums are friendly and will lead you to the best advice for your goals. To Bodybuilding for inspiring me to do what I love. To my family, friends, and lifting partner, Hunter Prose, for pushing me to the limit!